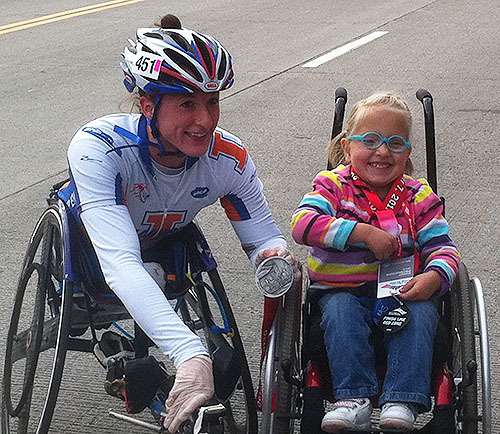 Tatyana McFadden (left) gave her winning medal to Addison, a friend who inspires her. 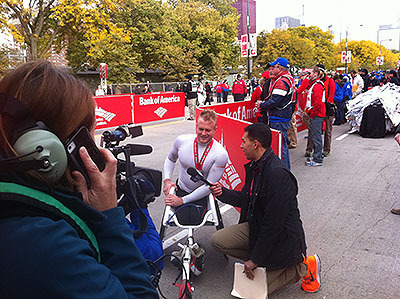 It was a crisp 38 degrees when the wheelchair athletes kicked off the Chicago Marathon. Josh Cassidy, 27, finished first with a time of 1:32:58. Cassidy set the world-record in the event with a time of 1:18:24 at the Boston Marathon earlier this year. Cassidy, of Toronto, focused on finishing strong and completely forgot to pass through the winner's tape. Officials frantically waved and pointed in the direction of the tape, but Cassidy paid no heed as he zoomed through the finish line. Born in Ottawa, Canada, Cassidy was diagnosed with neuroblastoma shortly after birth. It is a malignant tumor that can affect various parts of the human body. His form of the disease attacked his abdomen and spine, leaving him paralyzed after treatment. After years of hard work, he has become Canada’s top-ranked wheelchair racer. In addition to his racing prowess, he regularly hosts motivational speaking events. Tatyana McFadden, 23, of Champaign, won the women's wheelchair race in 1:49:52. McFadden was a three-time gold medalist at the London Paralympics this past summer. Born in St. Petersburg, Russia, McFadden has overcome adversity few can imagine. Born with a condition known as spina bifida, she was left paralyzed from the waist down. Normally, surgery is performed right after birth, but she had to wait 21 days because her mother could not care for a disabled child. Without hesitation, she was sent to an orphanage after her surgery. According to her biography, the orphanage was so poor, it couldn’t even buy crayons for the children. So procuring a wheelchair was out of the question. She had a head start in her career as an athlete, training her upper body right away as she walked with her hands the first six years of her life. When McFadden was six, Debbie McFadden rescued her by bringing her to the U.S. But her struggles would not be over yet, as she became severely ill shortly after arriving to the Baltimore area. McFadden persevered yet again and used sports as rehabilitation. Besides the various wheelchair sports, she tried her hand in swimming, archery and ping-pong. She ultimately fell in love with wheelchair racing -- a sport she had been training for since the day she was born. By using her strong upper body to move faster than any other women, she has inspired many, especially a young girl named Addison. Addison, like McFadden, was born paralyzed. Addison showed up early before the race Sunday to root for her hero. As soon as McFadden crossed the finish line, she went straight to Addison, hugged her and gave her the medal she had just earned.